The idea of universities being a “safe space” was until recently an issue that was unique to the US. Now the UK has experienced an upswing in incidents in which so-called “safe space” policies have reportedly threatened the right to free speech in British universities. Closely tied to the concept of “no-platforming” – where speakers are denied the opportunity to even speak – several highly publicised safe space cases have come to light, including the ejection of a student from a meeting for raising her hand, the banning of speakers such as feminist Germaine Greer, secularist Maryam Namazie, and equal rights campaigner Peter Tatchell, and the introduction of “safe space marshals” to monitor behaviour at debates. But the concept of a safe space, whereby those with distasteful or offensive views are prevented from speaking at a university, is fundamentally at odds with the rigorous intellectual exchange central to the idea of the academy itself. Our commitment to academic freedom means that we do not support so-called trigger warnings, we do not cancel invited speakers because their topics might prove controversial, and we do not condone the creation of intellectual ‘safe spaces’ where individuals can retreat from ideas and perspectives at odds with their own. Though the opinions of a speaker may border on the intolerable, we can only respond effectively to their arguments if we get the opportunity to hear them in the first place. In response, those in favour of safe spaces policies rightfully point out the symbolic and potentially legitimising force given to a speaker when we provide them with a public platform. To them, choosing who is given such a platform within their own institution serves as a justifiable form of counter-speech, and aims to send the message that such views are not worth listening to in the first place. How, then, can we hope to resolve these issues? Underlying these debates are disagreements regarding the proper “purpose” of a university. As an institution, the university holds a unique role in society as a place of learning and a forum of intellectual rigour. It comes with its own set of norms and customs, many of which contrast sharply with those of other institutions beyond its gates. Compared to other environments, such as workplaces or secondary schools, students and academics should (in theory) be encouraged to explore particularly difficult subjects, to take risks regarding emerging areas of research, and to debate some of the most contentious and pertinent issues of our time. So the safe spaces debate lands squarely upon this question of what a university is actually for. 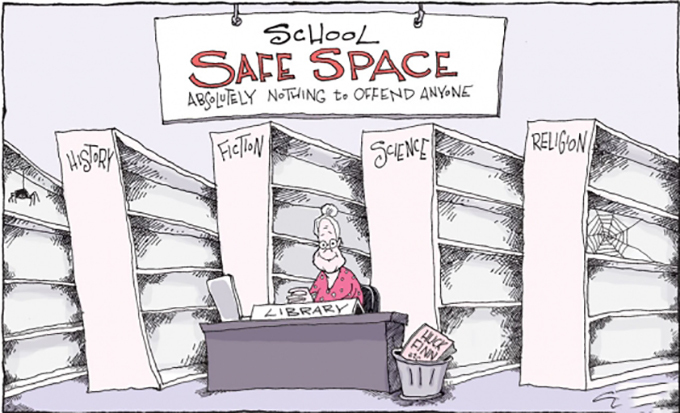 Defenders of the concept of safe spaces cite its noble goal of correcting past injustices for future endeavours – once silenced and marginalised voices are now, via safe spaces, provided with an opportunity to be heard and continue their studies free from harassment or abuse. Key also to the defence of safe spaces is the idea that vulnerable groups can carve out an area of their host institution in which they get to define their own norms and customs – again something previously denied to those from certain sub-sections of society. “Safe space” is a term long referred to in relation to women-only groups, LGBTQ+ organisations, black and ethnic minority groups, and so on. It allows members to meet and have discussions without the threat of silencing or discrimination from historically dominant groups. The debate surrounding a “clash” between safe spaces and free speech on campus, concerns itself with the idea that the university itself must be a safe space for all. As this is directly at odds with the raison d’être of the academy as the meeting point of rigorous disagreement, it is clear that universities are suffering from their own identity crisis, aided and abetted by the portrayal of such clashes on social media. Quite apart from the continued existence of student societies and clubs that set the terms for their own discussions, the issue surrounding those high profile cases of no-platforming tend to extend the boundaries of self-administration and rule-setting across the whole institution. This reconfiguration of the parameters of the safe space itself has something else in mind – that inviting certain speakers who hold offensive or hateful views in some way perpetuates a hostile environment on the university campus. What is needed is a common ground set of principles to which all sides must adhere. If universities are truly committed to free speech, this means making a concerted effort to increase representation and taking measures that include marginalised or silenced voices. It means introducing clear “right of reply” policies, in which controversial speakers are required to have their views challenged, rather than potentially shouted down or allowed to go unquestioned. In terms of legitimisation, this is largely determined by the nature of the invitation itself; including a speaker on a debating panel is one thing, giving them an honorary degree or lecture series another. Above all, universities need to work harder at enforcing formal measures to tackle discrimination and harassment on campus, as the recent hate speech case at Nottingham Trent University has shown. Until such shocking incidents are taken seriously by administrators, it is not clear how we can secure free speech exchange for all students.